Looks like iOS users enjoy surfing the web on their devices more compared to other OS’s, as a new report shows that Apple iOS is the leading mobile OS for users browsing the web. 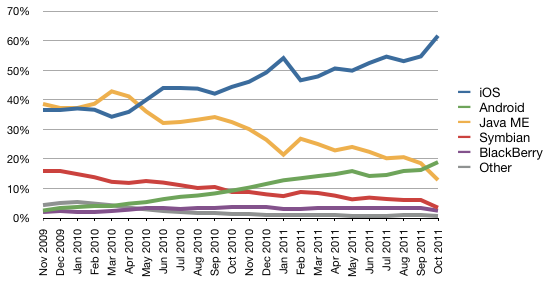 With the incredible launch that Apple had with the iPhone 4S it seems to have bolstered them into 60% of the mobile web browsing traffic. An incredible number considering that amount of non-Apple devices out there with mobile web browsing capabilities. As you can see in the image below from Net Applications, all platforms are taking a significant decrease in traffic as iOS and Android continue to rise. That alone seems par for the course as these two are the leading operating systems. Apple remains dominant when providing mobile devices, offering the iPhone, iPad and iPod touch, all of these devices have the ability to browse the web. With that said it is no surprise that they hold a large share of the mobile web browsing market and have continued to do so over the last two years. What I do find strikingly odd is the size of the gap between iOS and Android. Is mobile browsing not an enjoyable experience on Android? With Android being dominant globally, it seems like there would be a decrease in that 40% difference between the two. Personally I try to refrain from web browsing on any phone size screen regardless I absolutely have to, but with the ever growing popularity and vast number of Android tablets and smartphones, it seems that the numbers should have been better. I don’t even own an Android based tablet, so I can’t compare the experience with my iPad 2. I expected more from Android with the release of Honeycomb and companies like Samsung, Asus, and Acer offering competitive pricing on their devices when compared to Apple offering; the iPad. It seems, though, that most of the mobile web browsing is still coming from smartphones, when talking about Android, and not their tablets. Data shows that even Android smartphone users are buying the iPad instead of Android based tablets. I can partially understand as I feel that the Android tablets are feel cluttered; as-if there is just too much going on with the home screens. I felt that I needed to get certified in Android use just to navigate around.